The Starway Haode Wanyan Hotel (Shanghai Bangchen Wanyuan Dajiudian) is a business hotel situated among the iconic Shanghai skyline of Lujiazui. 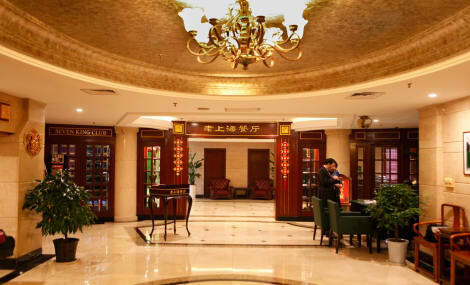 The hotel is a 30-minute drive from Hongqiao Airport and 40 minutes from Pudong International Airport.This 33-story Shanghai hotel is elegant and fully equipped. Guestrooms come with 24-hour broadband Internet and satellite TV. Guests staying for 30 or more days can make use of attached kitchens.The hotel's restaurants specialize in modern Western and East-Asian fusion cuisines. Guests can also enjoy tasty cocktails and cool libations in the hotel bar.Guests can relax or get energized on the third floor sauna and fitness center. Grab a bite at Cafe Uno, one of the hotel's 2 restaurants, or stay in and take advantage of the 24-hour room service. Snacks are also available at the coffee shop/café. Quench your thirst with your favorite drink at the bar/lounge. Breakfast is available for a fee. Enjoy a meal at the restaurant or snacks in the coffee shop/café. The hotel also offers room service (during limited hours). Quench your thirst with your favorite drink at the bar/lounge. Continental breakfasts are available daily from 7 AM to 9:30 AM for a fee. Stop by the hotel's restaurant, Kingtown Cofe, for lunch or dinner, or grab snacks at the coffee shop/café. Wrap up your day with a drink at the bar/lounge. Buffet breakfasts are available daily from 6:30 AM to 9:30 AM for a fee. Grab a bite at Misato, one of the hotel's 3 restaurants, or stay in and take advantage of the 24-hour room service. Wrap up your day with a drink at the bar/lounge. Buffet breakfasts are available daily from 6:30 AM to 10:00 AM for a fee.